Camping has always been considered a traditional British pastime, yet in today’s modern world it seems that less people are opting for a weekend out in the countryside. If you feel that you are spending too much time looking at a screen, and need some inspiration to dig out your old camping gear from the back of the garage, these 5 British films should do just that. Carry on Camping is an iconic 1969 British comedy that features the legendary Sid James and Bernard Bresslaw. James and Bresslaw’s characters are inspired to go camping after watching a film (just like we hope you will be). 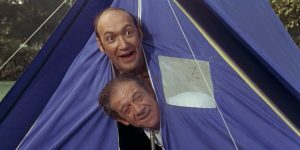 In typical Carry On fashion, the camping trip doesn’t go as planned when the group arrives at a campsite named Paradise, and realise that the place is anything but. Carry on Camping was shot at the beautiful Burnham Beeches in Buckinghamshire where I spent many summer holidays as a boy. The large beech woodland is perfect for spending a weekend away from the city. I hope that the scenic backdrop of Carry on Camping inspires you. Kes is a 1969 drama that ranks 7th in the British Film Institute’s Top 10 films to watch</a>. The film is famous for its accurate portrayal of working class life in the sixties. 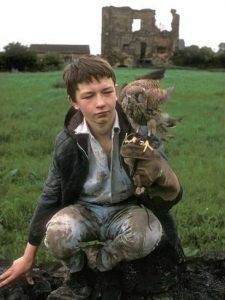 While the film is best known for the training of the kestrel bird “Kes”, the film is also notable for showcasing the beauty of the British countryside. Kes was shot in different locations, but one of the most beautiful outdoor scenes was at Parkside Road. Parkside is filled with stunning scenery that is enough to inspire even the laziest couch potato to get up and go camping. Robin Hood is a character that needs no introduction. Everyone knows the legend of the famous hero, and there have been many films based on the character. The 1991 version is a British film that starred Patrick Bergin as the thief that steals from the rich to give to the poor. While set in Sherwood Forest, the film was shot largely around Peckforton Castle, and the surrounding woodlands. The woodlands captured in the film are known for their scenic beauty. Robin Hood is admired among outdoor adventurers due to the fact he lives and survives in the wild. 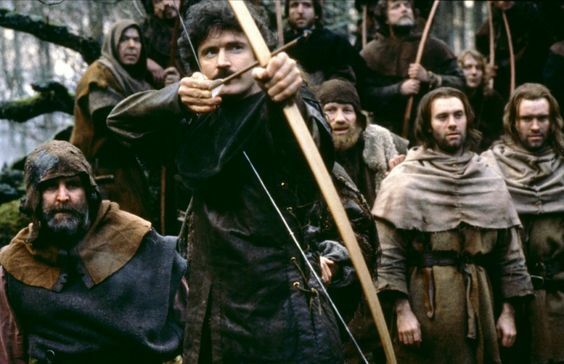 After all, Sherwood Forest is as much a part of the story, as the main character and his trusted bow and arrow. Recent adaptations of the famous story include Slingo’s popular Lady Robin Hood slot game that playfully switches up the gender of the hero, but makes sure that Sherwood Forest is there in the background as it is synonymous with the story and known the world over. No matter what you developers and storytellers do with the character, it isn’t the same without the famous forest playing a pivotal role. If you want to relive the British film, there are many campsites near Peckforton Castle, or you could even follow in the footsteps of the character and camp in Sherwood Forest. Monty Python and the Holy Grail is one of the most famous British comedies ever made. Despite being filmed on a shoestring budget, it made great use of the Scottish countryside. Part of the film was shot around Doune Castle, which is located in Stirling. 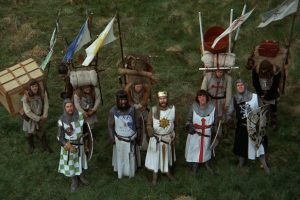 The castle was used to shoot several of the film’s most iconic scenes, including the taunting of French soldiers, and the musical number “Knights of the Round Table”. Castle Doune is situated next to the River Teith. While the castle may attract film buffs, the serene river and surrounding woodland is inspiring to anyone looking for a camping break in Scotland. Sightseers is a 2012 British horror comedy that was directed by Ben Wheatley and written by Alice Lowe and Steve Oram. In this film, couple Tina (Alice Lowe) and Chris (Steve Oram) go on a cross-country road trip that takes a deadly twist when they suddenly decide to slay everyone who annoys them. Several parts of the film were shot at Keswick in the Lake District, which is known for its scenic landscape and opportunities for outdoor activities. As the main characters make their way to their ultimate goal, several spots for treks and cycling can be seen. The Lake District is one of the best sites in the country for camping, and despite its dark subject matter, you can’t help but be inspired by the stunning views seen in the film. A bit of quality alone time does you good. I like this web blog very much, Its a real nice place to read and obtain info .